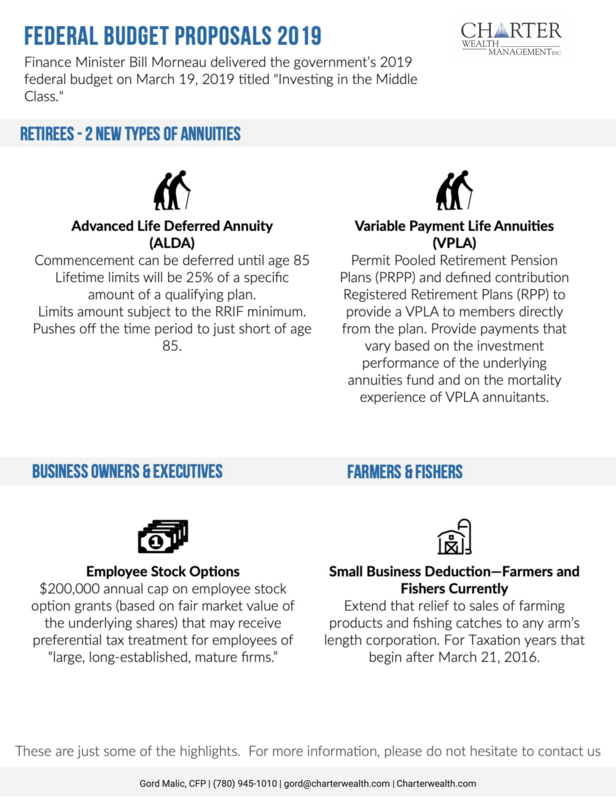 There are also unique ways utilizing life insurance and critical illness insurance to access your retained earnings. Please contact us to learn how we can get more money in your pocket than in the government’s. Business owners are increasingly recognizing the key importance of implementing employee benefit plans in their organization and this is an area that has grown considerably in recent decades. Employee benefits comprise all of the additional things that you offer to your employees on top of their regular salary, which could include pension contributions, health cover / insurance policies, training and education programs etc. Employees are more and more interested in the total benefits package that a potential employer can offer them, rather than just being focused on a binary salary figure and recognizing and understanding this cultural shift in the modern working world is crucial to maintain your ability to recruit and retain the right talent for your business. Many employees value the benefits that their employer offers, considering them an integral part of their take home pay, none more so than health cover. This benefit can provide financial and emotional security to your employees and their families, without the need for them to complete any health requirements to be on the plan. 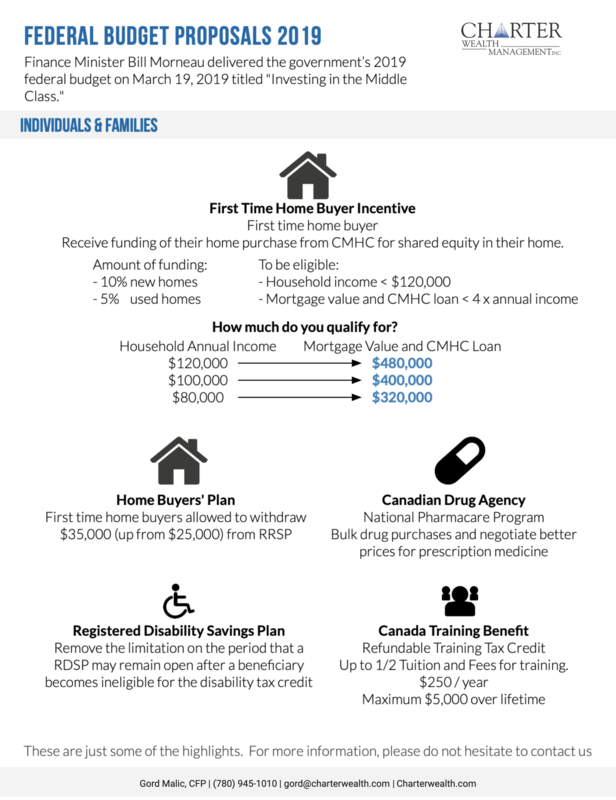 They are likely to benefit from a preferable level of cover and the plan may even provide them with insurance products such as long-term disability cover, which can be harder to gain outside of a group plan. What’s more, group plans often offer out-of-country emergency healthcare for employees which has the potential to save them money on personal travel insurance products. Not only do these benefits provide a sense of security to your employees, they can also help them to feel valued as part of your organization, which may in turn foster higher morale and increased motivation within their roles. It is therefore worthwhile for business owners to encourage their teams to recognize the fact that the benefits package that you offer should be considered as an integral part of their take home pay, alongside their actual salary. 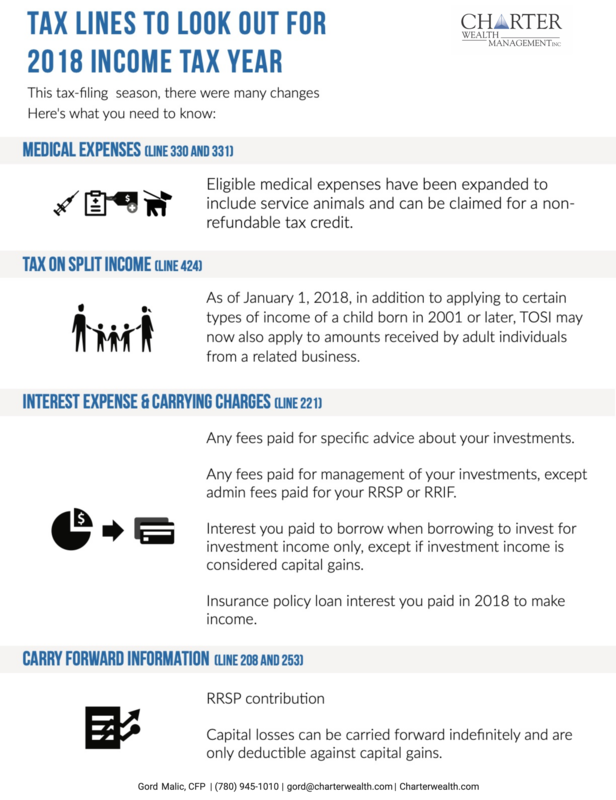 http://charterwealth.com/wp-content/uploads/2018/05/whyProvideEmployeeBenefits1_Facebook.jpg 717 1200 Charter Wealth http://charterwealth.com/wp-content/uploads/2017/04/charterWealth.jpg Charter Wealth2018-05-15 15:00:002018-05-15 15:06:22Why provide an employee benefits plan? ● Small Business Tax Rate Reduction from 10% to 9%. Since these changes will be effective January 1, 2019, a discussion and plan should be prioritized now, since 2018 will be the “prior year” of 2019. 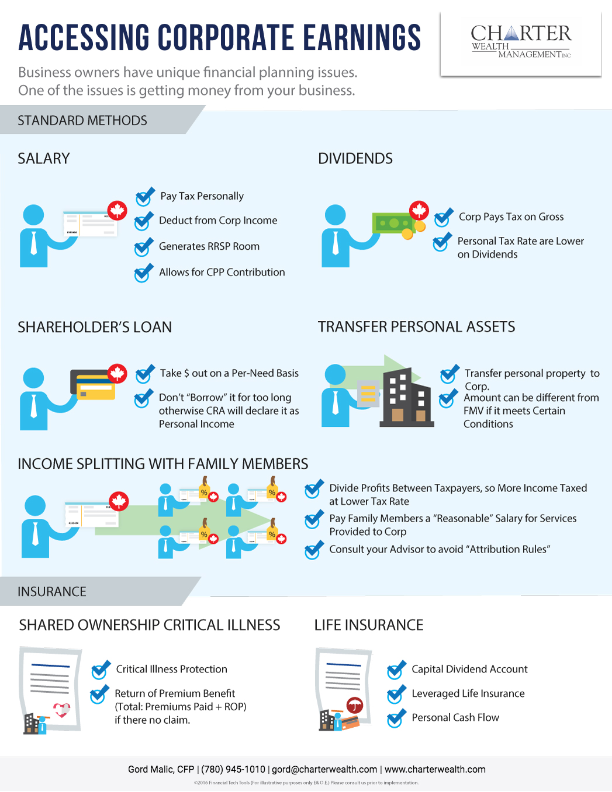 Life insurance is a great solution to help business owners address these problems. ● Problem: Lower corporate tax rates result in more capital trapped inside the corporation. ● Possible Solution: Life Insurance Proceeds credit the capital dividend account on death allowing for tax-efficient distribution of funds from the corporation to the estate. 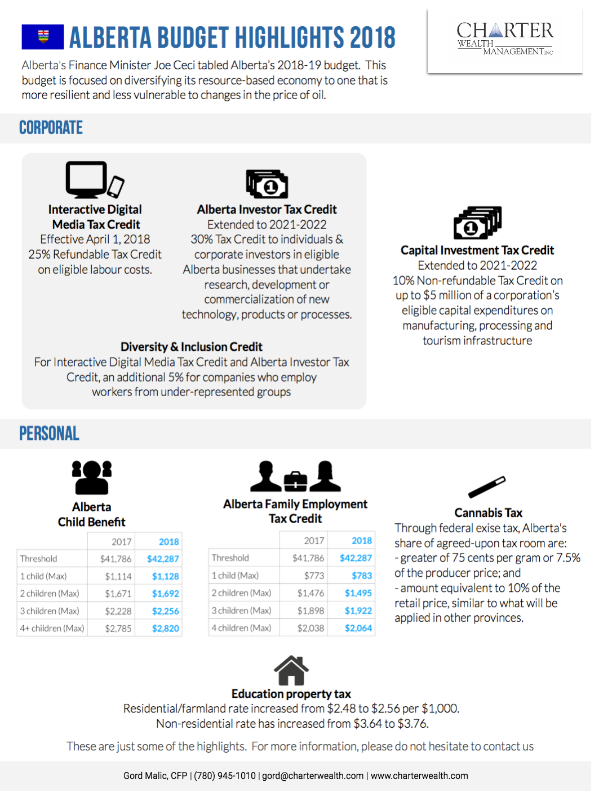 ● Key Change: Passive investment income greater than $50,000/year reduces the small business tax rate limit for small business tax rate. The business limit is reduced to zero at $150,000 of investment income. 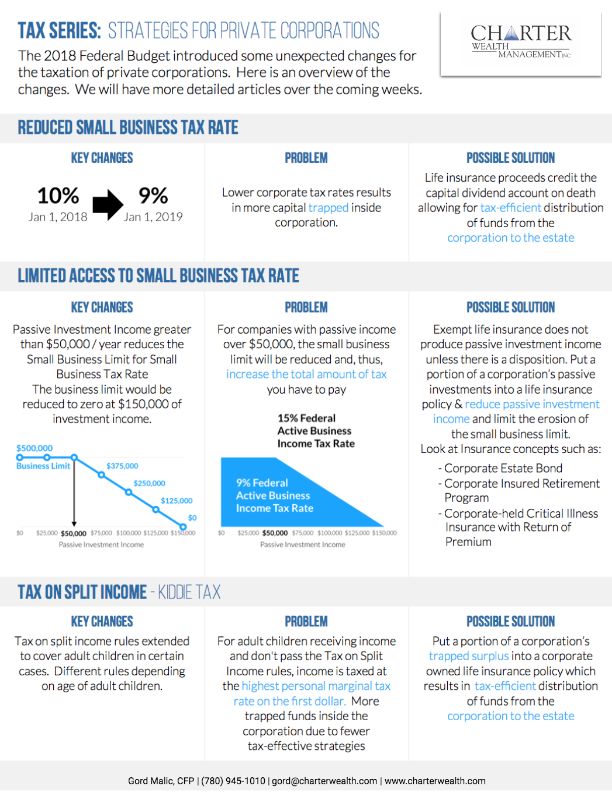 ● Problem: For companies with passive income over $50,000, the small business limit will be reduced and thus, increase the total amount of tax you have to pay. ● Problem: For adult children receiving income and don’t pass the TOSI rules, income is taxed at the highest personal marginal tax rate on the first dollar. More trapped funds inside the corporation due to fewer tax-effective strategies. ● Possible Solution: Put a portion of corporation’s trapped surplus into a corporate owned life insurance policy which results in tax-efficient distribution of funds from the corporation to the estate.